(v. p.), 1893. Half-leather bindings, with marbled paper boards. Bindings well worn, with Vol 1 lacking top 2" of spine leather. Some gatherings sprung. Vol 2 with color printed ticket "Fred W. Barry / Manufacturer of Account Books / Boston" to front paste-down. Vol 2 with boards held by cords. A Good set only.. 350; 310 [283 with mss text] pp. Volume 1 with 262 poems; Volume 2 with 62 poems/works. Mss glosses throughout. Tipped-in note & newspaper clipping following p. 229 in v. 1. 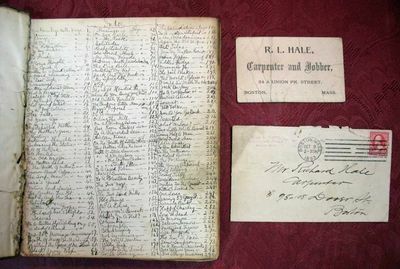 Laid-in are 2 newspaper clippings, 2 envelopes, one mss poem, one mss receipt & a "R. L. Hale, Carpenter and Jobber" business card. Drawings of Columbus Statue + 2 other figures, v. 2. p. 215, which illustrates the 7 page poem, "On Seeing The Statue of Columbus. "The Three Farraguts", 3 drawings p. 219, v. 2, illustrates the poem, "On See the Farragut Statue." 8-1/4" x 6-3/4"